Hello! Today I have another swatch to share. The box was Moulin Rouge themed, and while I didn't end up getting it during the preorder, Hayley recently listed some of the goodies over on the Danglefoot Polish website. Read on for my swatch of the 'Ard As Nails polish, 'Moulin Rouge', and a quick look at the Soap Dodger contribution! 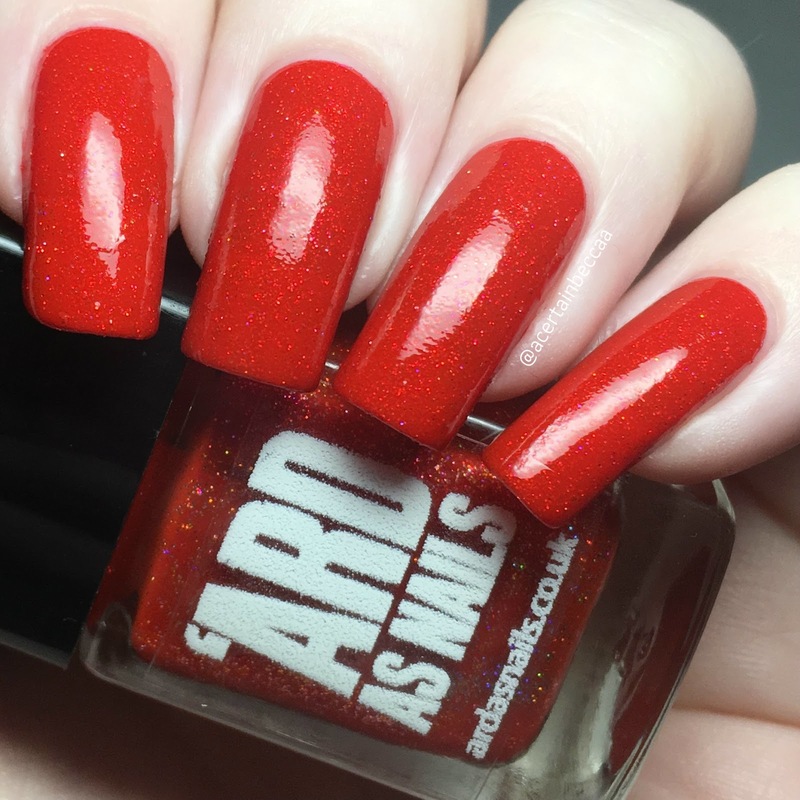 'Moulin Rouge' is a bright red with added holographic microglitters. The formula is ever so slightly on the thick side, but still smooth and easy to apply. I could see my nail line on the first coat, so added a second. This dries slightly textured but is easily smoothed with topcoat. Below is two coats with topcoat. The Soap Dodger goodie included was a absinthe green soap jelly in the scent peppermint. I don't think I've ever used a soap jelly before, but this looks super cool and I absolutely love the scent. I'll have to have a play with it and see what it's like. What do you think? Did you get your hands on the Moulin Rouge box? I do also have the Danglefoot Nail Polish, 'Come What May', so I'll make sure I share that soon!